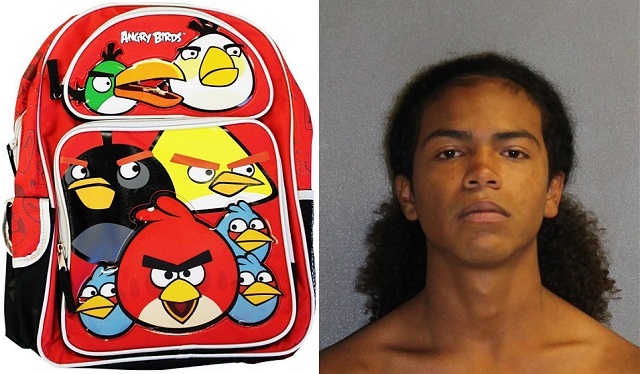 VOLUSIA COUNTY, Florida - An “Angry Birds” backpack spotted on a Florida man walking down a sidewalk early Tuesday morning was the break Volusia County sheriff’s investigators needed to make two arrests in the overnight armed robbery of a convenience store in Deltona, Florida. The employee put cash, cigarettes and cigars into the bag, handed it back, and the suspects ran off with it. A woman parked outside the store also witnessed the robbery and gave deputies a similar account. A review of the surveillance video gave deputies a detailed description of the suspects, including the distinct Angry Birds backpack. Deputies, K-9 units and the Sheriff’s Office Air One helicopter searched the area for suspects. About a half-mile away from the robbery, in front of a Dollar Tree store at 2135 Howland Boulevard, a deputy noticed a man walking down the sidewalk carrying a backpack with a “Bomb Bird” from the “Angry Birds” cartoon embroidered on it. It appeared to match the bag in the video. The 18-year-old suspect, Luis Montanez, was also carrying a black handgun. Deputies say that Montanez confessed to the robbery, and investigators also identified a second suspect, 18-year-old Devyn Omar Rivera, who was taken into custody later on Tuesday. Investigators also recovered the cash and cigarettes stolen from the store. Rivera is being charged with armed robbery and violation of probation. Montanez is being charged with armed robbery and petit theft.